Oceanfront, Private Heated Pool,Steps to Beach,Booking 2020, Beautiful Decor. Welcome to SEAS THE DAY! We are excited to bring you this totally remodeled Oceanfront four bedroom house, with all new appliances and furniture for 2017. Entire house has new furniture, new paint colors , new appliances and new washer dryer. We hope all the attention to detail will be appreciated as much as we like the improvements! 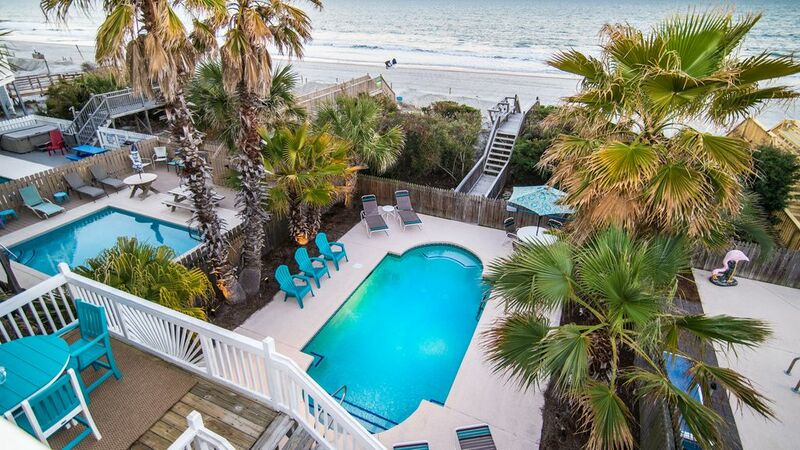 Surfside Beach South Carolina House Rental . Oceanfront covered porch, first & second levels, oceanfront sun deck, first level, street side covered porch, first level, private walkway to beach, exterior shower, private pool on ocean can be heated for additional charge , two parking bays (three covered, five total parks), professionally decorated, ceiling fans in all rooms, oceanfront master bedroom suite with whirlpool tub, well-equipped kitchen, TVs in all rooms including a new 55" Ultra High Def4K Smart TV, with Smart vs in both the master and the kids bunk bed room. DVD player in living room with wall & ceiling speakers, high-speed Internet. Beautifully landscaped, comfortable pool & deck furniture, picnic table and swing, twenty minutes from airport, 15 minutes from Restaurant Row in quaint MURRELLS INLET & PAWLEYS ISLAND, six blocks from ocean fishing pier, arcade and restaurants, one & a half hours from historic CHARLESTON. PLEASE BE ADVISED, MY HOUSE WILL NEVER BE ADVERTISED ON CRAIGSLIST.MY PHOTOS ARE BEING USED WITHOUT PERMISSION .NEVER WIRE MONEY TO ANYONE!!!!! Hello, growing up in New York,travelling around the world in an airline family taught me alot about travelling.It also gave me a love for it too.I am currently retired and spend time in different parts of the country, NY,SC,FLA,and CA. When I first heard this house was available ,we had to have it. The perfect vacation rental. Pool and Oceanfront! Location,Location. Nothing better than waking to the sounds of the ocean,or falling asleep with the same soothing sounds! Master bedroom has jacuzzi tub with shower, private toilet, two sinks. All linens including all blankets are cleaned every week for every guest. Ask our competitors if they go thru this extra expense. New appliances in 2017. We have everything you will need to cook your best meals. You can also enjoy dining at the counter and our new dining set out on the deck. More golf courses than you can count! We had 3 couples and 3 kids and had plenty of room for everyone! The house is beautifully decorated. It is conveniently located to many wonderful amenities. Our family stayed here Jan 2019 for my Mom's birthday weekend. The house is beautifully decorated, clean, a well stocked kitchen, just perfect. We enjoyed the wonderful ocean sunrises from the deck & master.Highly recommend this home! Thanks Rob! Fantastic and the view is breathtaking! We thoroughly enjoyed staying at Seas the Day. It's beautifully decorated with every comfort of home and lots of extras. We especially appreciated how clean the home is - truly spotless! Robert is an expert host - very responsive and accommodating. We highly recommend you stay here. Thank you. My caretaker works very hard at maintaining a clean house. On behalf of all my staff. Please come again! We had the most relaxing and fun vacation! The house was just perfect for our family. It was beautifully decorated and very clean. We spent most of our time during the day outside enjoying the spectacular views from the deck and balcony or soaking up the sun at the beach or poolside. Our evenings were spent playing games or watching TV together. We would highly recommend Seas The Day and hope to return again in the future. The house is as beautiful as it appears in the photos. Gorgeous! This is a wonderful beach home. The interior is beautiful and very clean. You can't beat the location directly on the beach. The owner is very responsive if you have any questions during your stay. Don't hesitate to rent this place. It is a winner! Yes we are right on the beach! Just a few blocks south of the Surfside pier. Close enough to walk but far enough not to deal with the crowds.